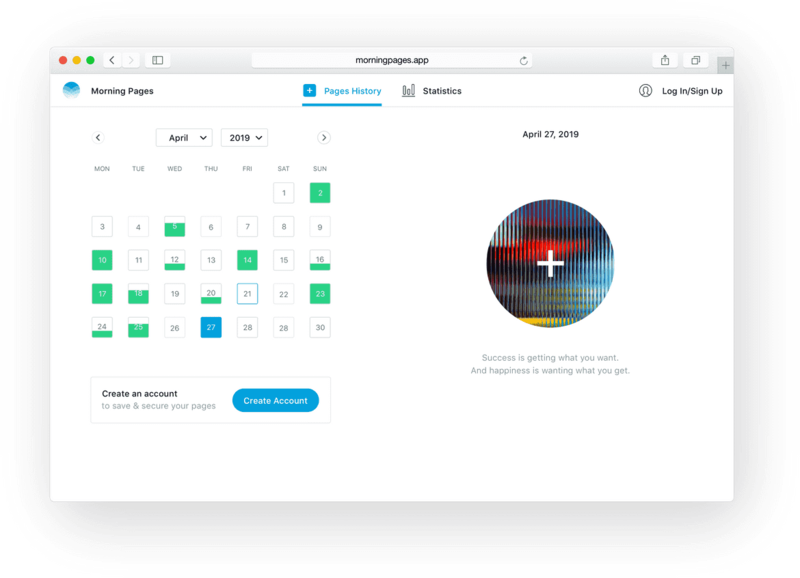 MorningPages | Write Morning Pages on iPhone, iPad, or in your browser. 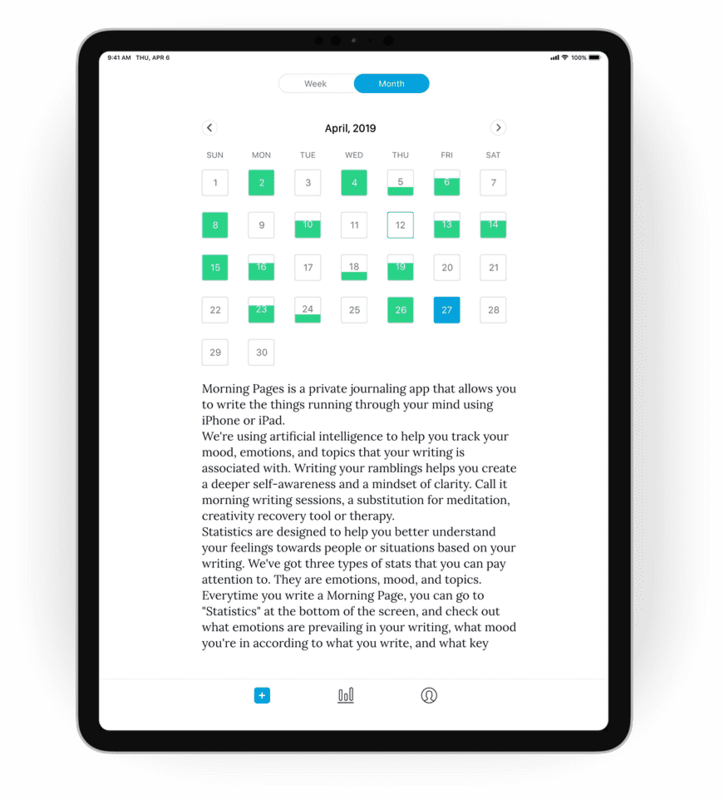 Write Morning Pages on iPhone, iPad, or in your browser. It's advisable to write up to 500 words or more in the app. You can come back and edit your pages anytime. iCloud backup lets you access your writing across devices, so you can be sure you won't loose your pages. 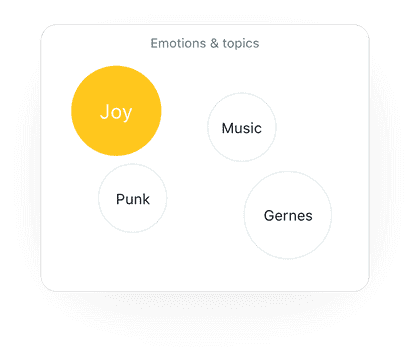 The app tracks your mood, emotions and topics you write about, helping you become more self-aware. Insights show what mood you are in, what emotions you are feeling now. See how your mood changes over time, and what emotions are dominant over the past weeks or months. Topics reflect the short summary of the text, and emotion circles help you understand its emotional coloring. Your writing contains positive, negative, and neutral words. This chart will show your daily, weekly, and monthly mood states based on your language. Morning Pages are not only for morning persons. If your thoughts flow better at night, we've got that covered! 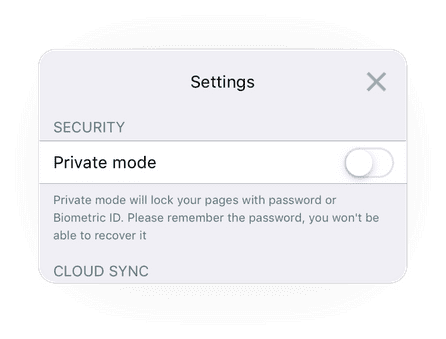 Use Private Mode in the app Settings to lock and password protect your pages so only you can access them. 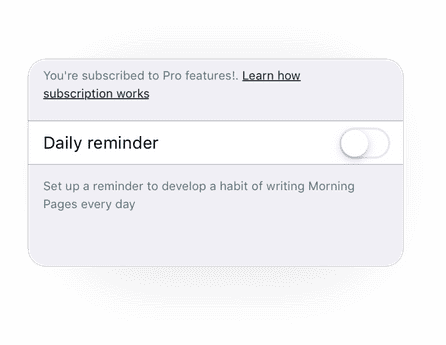 You can set up reminders to get in the habit of regular writing. Start off by committing to 10 days of Pages! Our mind is a non-stop thinking machine. The only time when it feels refreshed is morning. Writing in the morning lets you set the tone for the entire day and fills you with good thoughts. 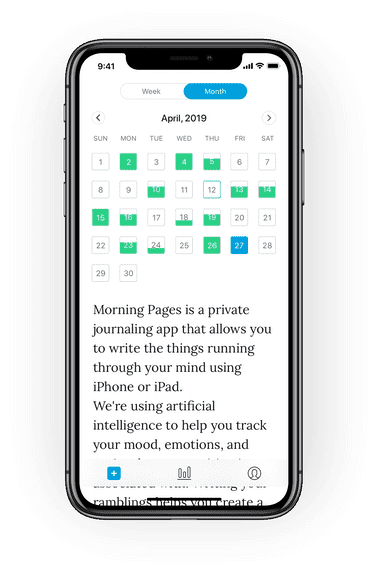 Morning Pages is about allowing your stream of consciousness appear on the page. Nevermind grammar or misspellings. Concentrate your mind on the present moment and let those words flow. A regular writing habit will help clear your mind, reduce anxiety, and get new ideas. By releasing your anger, worries, and sorrows you unlock your creative self and get rid of negative thinking. Writing Morning Pages is like having a deep conversation with yourself. It's about acknowledging and accepting your thoughts and feelings and learning to trust yourself. This leads to positive thinking and improves your well-being. I’ve only been using Morning Pages for a few days but I read The Artist’s Way about five years ago. I probably have about 5, half-filled notebooks I used as morning pages in the past few years, but I love having access to these on my phone. Also I adore the beautiful pictures and inspirational quotes. And the analytics are really interesting. No overwhelming ads which is also a breath of fresh air. Love this. Simple and effective. A great brain drain. 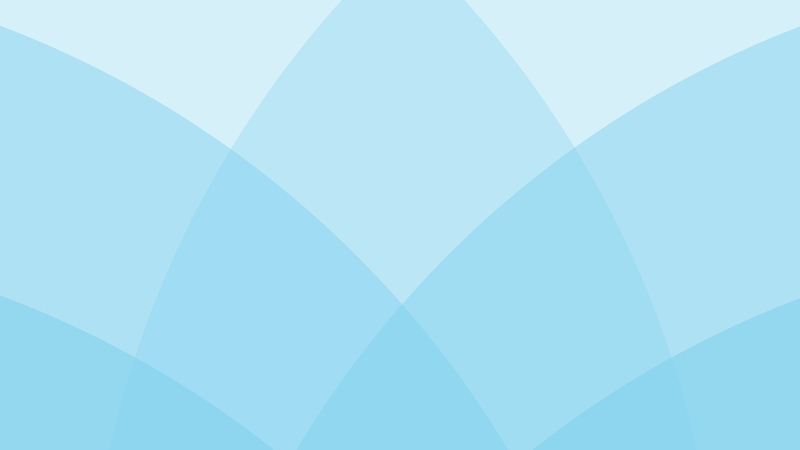 A delightful app that keeps getting better and better! Really good app to write your thoughts, also gives interesting insights on your daily mood, like it. I love this app! It's beautiful and simple. 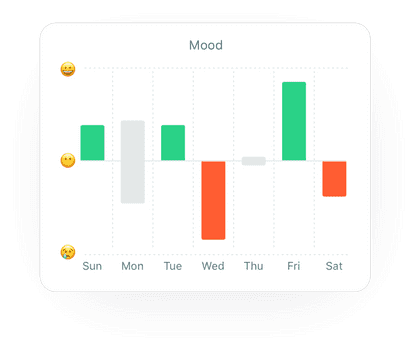 I really like the emotion analysis feature and how I can track my mood changes with time. I thoroughly enjoy writing Morning Pages! It is my favorite app so far. Perfect - just what I've been waiting for! 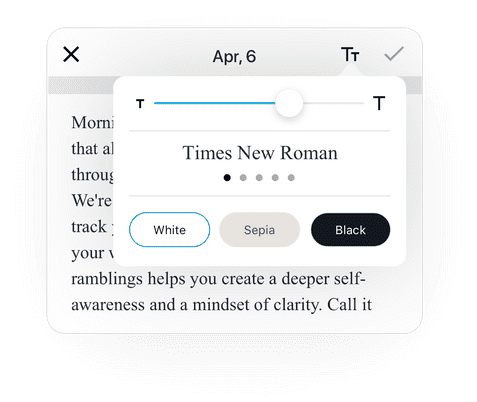 There used to be or still is a web based version of morning pages called 750 words but I've been waiting a long time for an app based option. Actually love that it's 500 words with optional to infinity. Also lets you set reminders. Text is fairly large easy to read. Other good features but overall perfect for my needs gets the job done to drain my brain. I have been using this app for about a week now and really enjoy it. I am finding myself opening the app first thing in the morning and letting my thoughts just flow for a while!